Several members of the eButterfly team attended the 2016 XXV International Congress of Entomology from September 25 to 30 in Orlando, Florida. 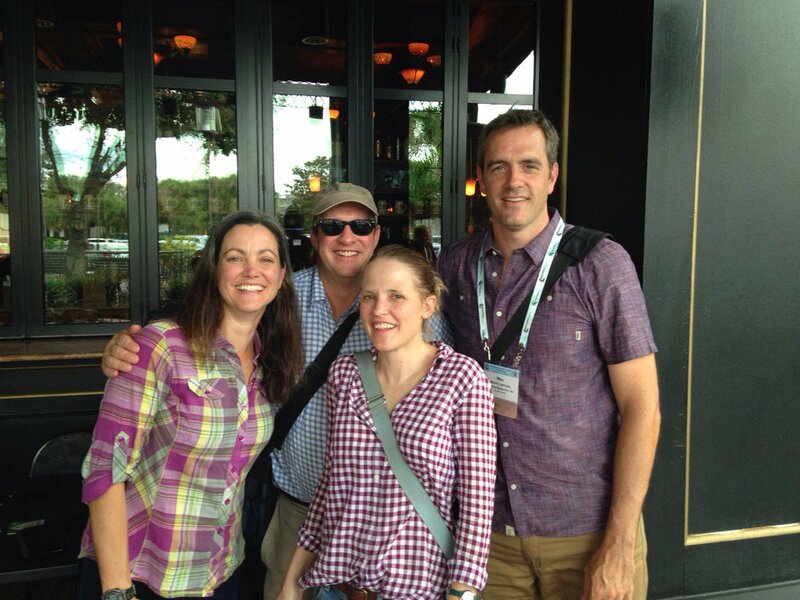 eButterfly sponsored a symposium titled, “Keeping Science in Citizen Science” during the meeting. The symposium was extremely well received and inspiring to all of us as many of the speakers demonstrated the value of citizen science data in insect research and conservation. And of course, since we were in Florida…we had to go butterflying! Citizen science projects require thoughtful experimental design, analytical capacity, and data management to be able to answer novel biological questions, monitor populations, and help conserve species at both large and small scales. This scientific approach requires new and special toolkits to engage citizen scientists in the process in the most meaningful ways possible. The symposium presented successful case studies in entomological research, monitoring, and conservation from continental-scale projects to state and city -wide initiatives. Presenters integrated knowledge from natural history collections with current online database approaches in ecology by showcasing citizen science programs in museums, non-government organizations, and universities. Each presented examples of best practices in data collection, management, analyses and archiving for insect big data science. You can read the abstract online and learn more about the projects that were presented. Palmetto Skipper, Kissimmee Prairie Preserve. Photo Maxim Larrivée . Of course, we took full advantage of being in Florida to explore a few of Florida’s natural ecosystems and pollinator gardens with some amazing local butterfly experts. On September 27th, Max Larrivée was treated to the butterfly fauna of the Kissimmee Prairie Preserve with Florida butterfly experts Linda and Buck Cooper. Their keen knowledge of the butterfly fauna of the preserve allowed Max to make several amazing butterfly observations such as the Florida Dusted Skipper, Aaron’s Skipper, Palmetto Skipper, Berry’s Skipper, and the amazing Little Metalmark among the 38 species they recorded that day. Andy Warren shows us some of the amazing and incredibly curated historical collections. The eButterfly team took a trip up to the McGuire Center for Lepidoptera and Biodiversity in Gainesville, which serves as both a research and public education center. It includes a 6,400-square-foot living Butterfly Rainforest (we we spent some quality time with some fabulous tropical butterflies), an adjacent 4,600-square-foot exhibit gallery featuring information about Lepidoptera and rain forests worldwide, as well as more than 31,000 square feet of research laboratories and collection space. Andy Warren, Senior Collections Manager, gave us an amazing tour of the facilities. 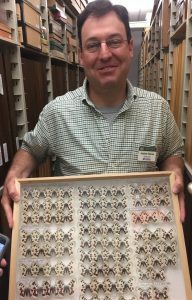 The Lepidoptera Collection of the McGuire Center is located on three floors and is housed in compactors with a capacity of 77,000 drawers. Andy showed us some amazing specimens and historical collections and even spotted a Polydamas Swallowtail outside the museum on the way to lunch! On the way back to Orlando, we stopped on a backroad and found 14 species of butterflies between thunderstorms. On October 1st after the meeting ended, Jeff Ward, eButterfly regional expert for Florida, and four members of the Hairstreak NABA chapter (Dean and Sally Jue, Dave McElveen and Virginia Craig) hosted Max Larrivée and showed him the amazing butterfly diversity of Elinor Klapp-Phipps Park and two other Panhandle hotspots around Tallahassee. 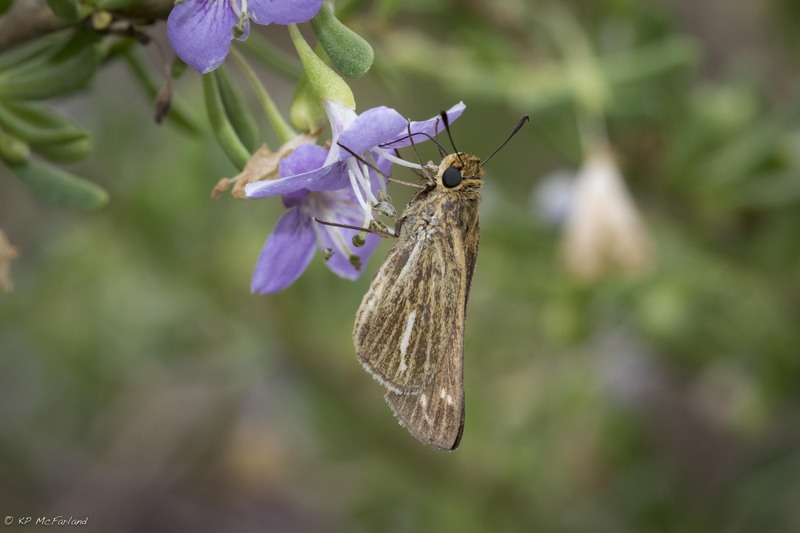 Dean and Sally Jue have been monitoring the Golden Banded Skipper population of E. K. Phipps Park for over a decade. This turned out to be another epic butterfly day both in the number of individuals recorded and their diversity with a combined effort of 40 species observed during the day. 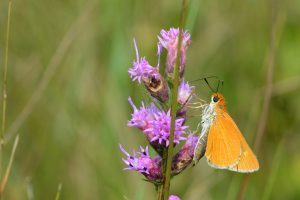 Max was treated to a few iconic southeastern butterflies such as the Southern Dogface, the Southern Pearly-Eye, the Southern Skipperling and the Laced-Winged Roadside Skipper. Other potential notable species that day for Max Larrivée, such as the Gemmed Satyr and the Great Purple Hairstreak, will be the motivation for a future visit! Meanwhile Kent McFarland, visiting relatives on the Gulf Coast after the meeting, headed to the Withlacoochee State Forest Citrus Tract on a tip from Andy. With thunderstorms nearby, he was dazzled by a hike through pine savannah recording 17 species of butterflies and logging an eBird checklist too. A late afternoon stop on the coast at Fort Island Beach yielded Salt Marsh Skippers nectaring Christmasberry (and some cool birds for an eBird checklist too). A morning visit to Hammock Park in Dunedin turned up 9 species and a visit to Honeymoon Island a few more. 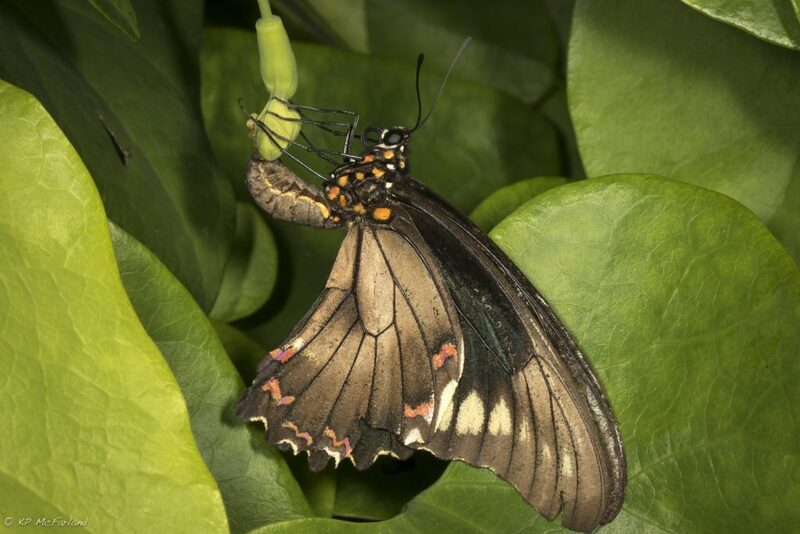 Kent was delighted to watch a Polydamas Swallowtail laying eggs on pipevine at the Museum of Science and Industry butterfly garden outside of Tampa. Overall, the team was able to record 67 species, add many checklists to eButterfly, and meet some great people. We can’t wait to visit again!